Dusty Baker has only been the manager of the Washington Nationals for 35 days, and he didn’t wait until spring training to start saying outrageous things. Nope, he decided to jump right in during his news conference at the Winter Meetings. Baker touched on issues from the latest domestic abuse allegations against his former closer Aroldis Chapman to the needs of his new team. I’d say the entire episode was hilarious, if it weren’t so depressingly tone-deaf. Let’s start with the one everybody is talking about: his defense of Aroldis Chapman following reports of the closer pushing his girlfriend against a wall, choking her, and when she broke free and hid in a bush for safety, firing a handgun eight times despite the girlfriend’s four-month-old daughter still being in the house. The incident was said to stem from a text message on Chapman’s phone. While no charges were filed due to a lack of evidence, these are serious allegations, rumored to have broken, or at least delayed, a trade with the Los Angeles Dodgers. Of course, Baker was asked about this. He and Chapman were together for a long time, and since the timing of his conference came so close to the news, the question was inevitable. It didn’t go down that way, because after all this is Dusty Baker we’re talking about. Instead of taking the diplomatic road, Baker felt it behooved him to call Chapman a “heck of a guy.” Not once. Twice. Even suggesting that he wouldn’t mind having Chapman on the Nationals, even though they already have one malcontent occupying the closer’s role. Never mind the fact that he’s accused of choking a woman and firing rounds in his garage during a fit of rage, or the fact that he’ll join Jose Reyes and Yasiel Puig as poster children for MLB’s new domestic abuse policy. 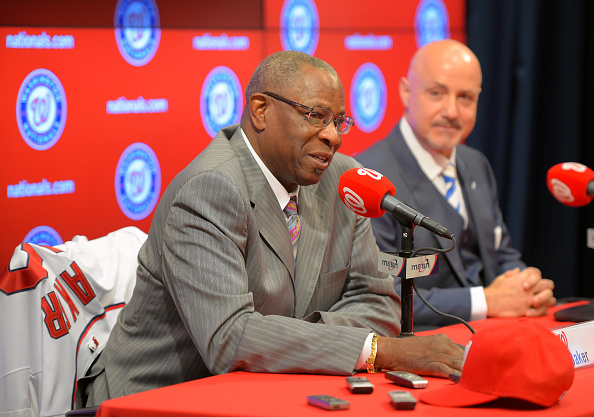 While he was ripped to shreds across the internet by various sportswriters and fans alike, the Nationals had Dusty clarify his comments, and he didn’t do much to help matters. “The Chapman I knew” not only reaches mightily to sound as non-partisan as possible, but also sounds like the title of a bad 19th Century English novel. Baker said what he said about Chapman being a “heck of a guy,” and then claimed he hopes he’s innocent in an attempted clarification. You can only clarify something so many times before it becomes transparent. Baker’s an ol’ boy who doesn’t want to see one of his old favorites get in trouble. Tim Baffoe, a writer for Chicago’s 670 The Score and The Cauldron, translated it on Twitter as, “I hope his accuser is lying.” And really, it sounds an awful lot like that. Dusty Baker needs to do better. Like him or not, he’s an ambassador for the game of baseball, as few men that have been around as long as he has are still in the game. He’s a leader of young men, and the casual nature by which he discussed the horrifying allegations against Chapman does his players and the game of baseball a huge disservice. Especially as Rob Manfred determines the precedent for suspensions in domestic violence cases under the league’s new policy. This is a turning point in professional sports that’s too long overdue, and comments like Dusty’s yesterday stand in the way of actual progress. Even if Manfred lays down the hammer like no commissioner ever has before, what Dusty said yesterday perpetuates that the game’s on-field personnel may not take it as seriously. And that’s a problem. The best thing Dusty could do during his time in DC is stay quiet about real world problems and hilariously lament the lack of importance in on-base percentage while saying his team needs to score more runs.